The CBI is trying to file a charge sheet in the railway job bribery case by July 3 and still awaiting sanction from the ministry to prosecute key accused Mahesh Kumar, sources said Monday. Central Bureau of Investigation (CBI) director Ranjit Sinha told reporters here that the probe was still underway. “The probe is still on. We will try to file the charge sheet,” Sinha said when asked if the agency would meet the deadline of filing the formal set of charges within 60 days. 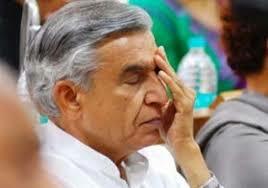 Pawan Kumar Bansal had to quit as the railway minister after his nephew Vijay Singla was arrested in the bribery case. The CBI questioned Bansal in the case. Singla was allegedly paid a bribe of Rs.90 lakh by Railway Board member Mahesh Kumar for being appointed to the post of member (electrical). Singla and Mahesh Kumar were booked as main conspirators in the bribery case in which eight more people have been arrested. Mahesh Kumar, posted as Railway Board member (staff), was arrested May 3 while Singla was arrested May 4. Sources said the CBI approached the ministry for granting sanction for prosecution against Kumar but it was still awaited.